While many groups prefer Full Day trips, Half Day Fishing trips are great for small groups, scouting trips, Father-son/daughter, Senior Citizens and after work company fishing parties. Afternoon trips usually start at 4:00pm. The late afternoon is often the nicest part of the day. Contact the Yankee III for more information. 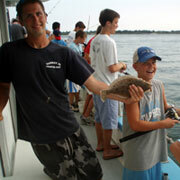 Known for its excellent Flounder and Fluke fishing. The famous Hecksher Park Flounder grounds and the equally famous Fire Island Fluke grounds are within a short boat ride from the Captree Boat Basin. During the fall season, Blackfish and Sea Bass are widely available. All in the calm protected waters of the Great South Bay. 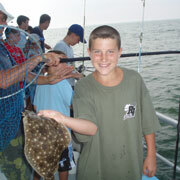 Off Fire Island lures Fisherman with exciting deep water action. This area is famous for Bluefishing at the Patchogue Grounds, the Light Ship, Cherry Grove and many more. Contact the Yankee III for available dates and rates.